I know that the late Steve Jobs has proven himself to be an inspiration to many, although there is also a darker side to him that only those who have worked alongside him know. Still, the man’s achievements in the world of tech cannot be denied, not to mention how he more or less single-handedly revived Apple from the doldrums and saved the company he co-founded with others to bring it to the forefront of consumer technology, all the while revolutionizing the tablet and smartphone market. 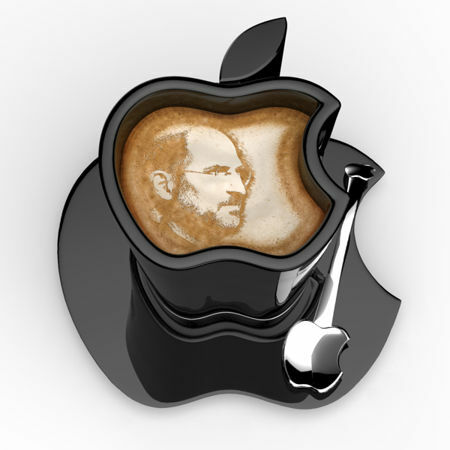 Now here is a concept that pays homage to the man – the iCup. The iCup happens to be an Apple logo-shaped mug that was designed by Tomislav Zvonari, where the iconic Apple logo will be accompanied by a matching stirring spoon and saucer. You can plug in the iCup to your Macbook via USB in order to heat up the plate, while ensuring that the mug as well as its contents remain nice and warm while you work on your machine.